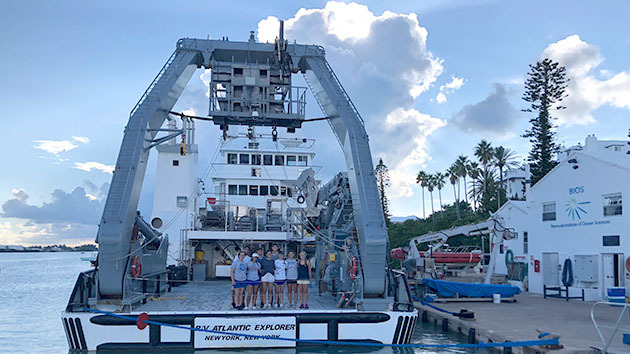 Students participating in BIOS’s Research Experiences for Undergraduates (REU) program in 2018 pose on the stern of the research vessel Atlantic Explorer after returning from a cruise. 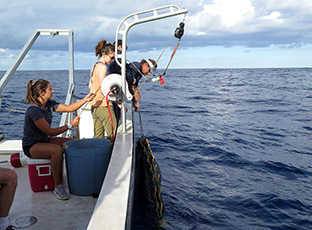 This internship-based program offers undergraduate students the opportunity to conduct hands-on research in a variety of STEM fields, including oceanography and atmospheric science. Each spring, BIOS is one of more than 350 colleges, universities, medical centers, professional organizations, and research institutions that accepts undergraduate students as part of the National Science Foundation (NSF) Research Experiences for Undergraduates (REU) program. For more than 30 years, the REU program has given U.S. students the opportunity to conduct hands-on research in science, technology, engineering, and mathematics (STEM) fields as part of their undergraduate education. The internships offer students travel and housing support, a modest stipend, and include research opportunities in a wide range of academic fields, such as applied physics, cyberinfrastructure, materials research, cognitive sciences and—BIOS’s specialty—ocean and atmospheric sciences. 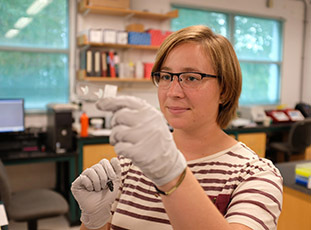 Over the course of three months, beginning in late August of each year, BIOS’s REU students work with faculty and staff at the Institute to identify research questions, develop experimental procedures, conduct data analysis, and share their final results in a series of oral and poster presentations. During this time, the students also take part in a number of workshops centered around topics relevant to STEM degrees and careers, such as statistical analyses, presentation skills, writing proposals and broader impact statements, and developing research summaries and elevator speeches to help communicate their science to a general audience. Last year, eight students participated in the BIOS REU program, each from a different educational background and undertaking unique research projects aligned with their academic interests and career goals. Here, we introduce you to the students and describe their respective research projects based on the research summaries they developed, as well as their reflections on their time at BIOS. 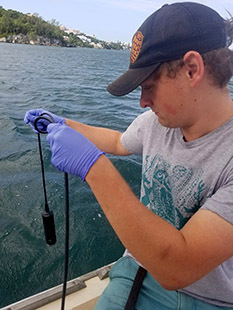 Cooper, an oceanography major, is finishing his last year of undergraduate education at the University of Washington (UW) in Seattle. Prior to his REU internship, he spearheaded dissolved inorganic carbon and alkalinity measurements for various graduate projects at UW. During his time at BIOS, Cooper worked with Eric Hochberg, a reef ecologist, to collect data using a profiling reflectance radiometer and to investigate trends in the variability of water clarity. Specifically, he measured the rate of loss of different colors of light as the different wavelengths travel downward through the water column. 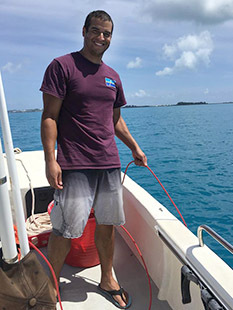 His data will serve as a method to ground truth remotely-sensed water clarity data collected by aircraft, which is a more cost-effective method for studying light as it relates to coral reef ecology. Corbett is a third-year marine science major at Eckerd College in St. Petersburg, Florida. Her interests in marine science and anthropology intersect to form a passion for understanding human-environment relationships, and she has conducted conservation research at Eckerd studying bonnethead shark populations and sea turtle feeding behaviors. At BIOS, Corbett worked with research specialist Tim Noyes to assess native fish diversity in deeper reef systems in an effort to understand how invasive lionfish impact these areas. In Bermuda, lionfish abundance is greater in deeper reef systems and native fish diversity at these depths is largely unknown, making these areas crucial foci for conservation research. Her project also aimed to assess the utility of lionfish-specific traps in preserving native biodiversity. Flesher is a junior at Arizona State University in Tempe studying chemistry and biology, with plans to attend graduate school to pursue a career in academia. He is interested in biochemical processes and the beautifully complex and subtle mechanisms that support life, specifically those related to photosynthesis. 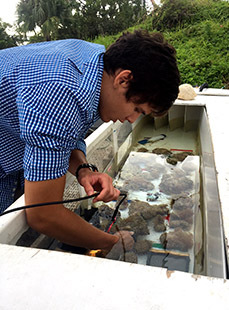 During his REU internship, Flesher worked with postdoctoral researcher Yvonne Sawall on a project looking at primary producers in a coral reef. Specifically, he investigated how efficiently coral reefs use available light for productivity by isolating individual reef communities in a “flume” (similar to a large, outdoor aquarium) and measuring the changes in oxygen and sunlight levels within the flume throughout the day. Comparing these measurements allowed him to better understand how efficiently each community uses light, which can then be used to model how a reef might respond to changing light levels. Formby-Fernandez is a junior studying engineering physics at Embry-Riddle Aeronautical University in Daytona Beach, Florida. She plans to continue her education with a doctorate degree in physical oceanography, focusing on the development and use of autonomous underwater gliders. 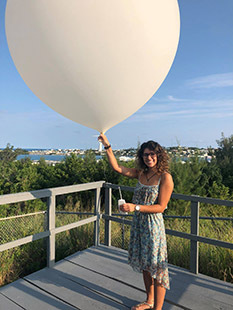 Formby-Fernandez worked with Mark Guishard, program manager at the Risk Prediction Initiative at BIOS, researching the effects of cold water upwelling on the atmospheric-level winds that steer a hurricane’s horizontal movement. Using Hurricane Bertha, which passed by Bermuda in 2008, as a case study, she investigated whether these winds led to forecast errors in model tracks of the storm, which will help researchers better understand hurricane behavior. Ju is a junior at Yale University in New Haven, Connecticut studying environmental science. A New Englander at heart, she has studied forest ecology and animal behavior, and is excited to transfer her experiences in those fields to marine biology. 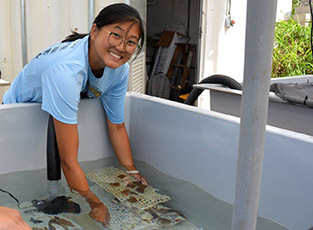 For her REU internship, Ju worked with reef ecologist Gretchen Goodbody-Gringley on a project studying the thermal tolerance of coral populations from both mesophotic (deep) and shallow reefs in Bermuda. She conducted incubation trials in which coral fragments were exposed to varying temperatures in a controlled lab environment. Using respiration to measure fitness, the data she collected will help predict how coral species respond to different temperatures. In turn, this can help determine if mesophotic reefs can serve as a refuge site for shallow coral species that are under threat from global climate change. Palino is a fifth-year environmental engineering student at the University of Florida in Gainesville, where her interests include Geographic Information Systems (GIS) and modeling techniques to better understand coastal environments. In 2018 she co-wrote an extension publication describing the basics of using Quantum GIS (or QGIS) to create maps and analyze data. She will graduate in December of 2019 and plans to pursue her doctorate in biological engineering. During her time at BIOS, Palino worked with microbial oceanographer Rachel Parsons in the Microbial Ecology Laboratory. Her research involved studying microbes at Devil’s Hole, located in Harrington Sound, Bermuda—an area that undergoes a decrease in dissolved oxygen in deeper waters during the late summer and fall. Microbial communities are responsible for keeping the balance of nutrient cycling and oxygen in aquatic environments. However, scientists predict that climate change will lead to a global expansion of oxygen minimum zones, which will significantly impact the microbial communities. Her project aims to predict which microbial species will be present in years to come, as well as the potential severity of subsequent widespread fish kills. Weaver is a senior undergraduate in microbiology at Oregon State University in Corvallis, Oregon. His background is in analyzing aquatic microbial ecology using DNA sequencing. He is interested in how microorganisms affect the larger world and fit into systems that affect humans, such as agriculture and fisheries. He plans to further his knowledge in graduate school by focusing on analyzing and comparing toxic and volatile proteins produced by microorganisms and how they affect larger systems. Weaver also worked with Rachel Parsons in the Microbial Ecology Laboratory at BIOS on the long-term Devil’s Hole Project. During the warmer months, levels of oxygen begin to drop in the deeper waters, which leads to a changing variety of nutrients available to bacteria. Weaver’s project focused on symbiotic microbes that form bundles with each other, called aggregates, which help to more efficiently transfer nutrients between individual microbes. The work done in Devil’s Hole will hopefully shed light into how oxygen minimum zones form and change in larger marine environments, and how we might reduce their spread in the future. Wingate attends Georgia Military College in Milledgeville, Georgia where she is pursuing an undergraduate degree in biology. She has previous research experience radio tracking eastern box turtles and eastern diamondback rattlesnakes, sea turtle tagging projects, and photo identification of bottlenose dolphins. 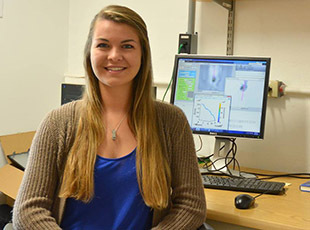 After completing her degree, Wingate plans to attend graduate school to study marine animal behaviors and bioacoustics, which is the cross-disciplinary study of how animals produce, use, and receive sounds. For her REU project, Wingate worked with biological oceanographer Amy Maas investigating the swimming kinematics, or styles of motion, of four individual species of pteropods—small, pelagic swimming snails also called “sea butterflies.” By using tracking software in the computer program MATLAB, she helped identify the swimming efficiency of each species based on their respective shape and size. Pteropods are ecologically important because their calcium carbonate shells dissolve in acidic conditions, making them among the first organisms to be impacted by ocean acidification. For more information on the BIOS REU program, please visit http://www.bios.edu/education/reu.